Drum Point Light is one of three surviving Chesapeake Bay screw-pile lighthouses. 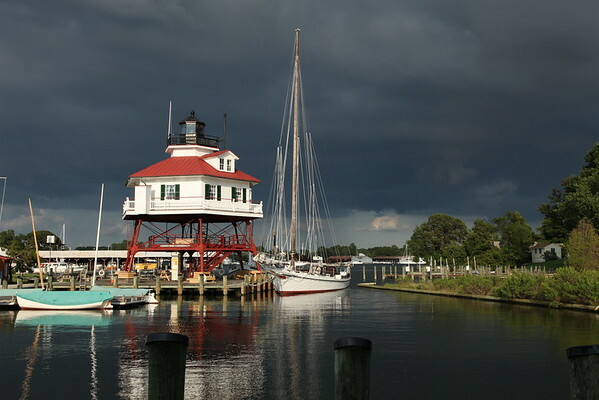 Originally located off Drum Point at the mouth of the Patuxent River, it is now an exhibit at the Calvert Marine Museum. Thank you Arnold. I thought the perfect storm was about the hit us. I love the lighting in this photo. Thanks guys. I love this place. I love the dark sky as a backdrop to this lovely scene. Laura you are so welcome and thanks for your kind comment. Lovely contrast here Sharon. Thanks for your comments on my photos.